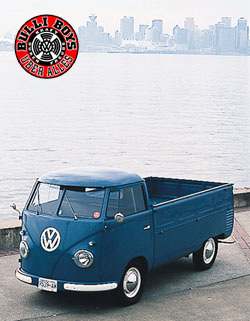 This is Kevin Thornton's 1956 VW Singlecab Pickup, on the Seawall at Waterfront Park in North Vancouver. Great view of Vancouver skyline in the distance across harbour. 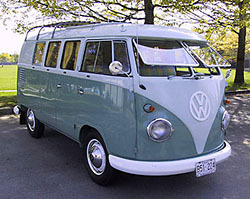 This is Barry Guscott's 1962 VW Westfalia SO-34 European, restoration complete...just before shipping all the way back to Germany to it's new owner! Who are the Bulli Boys anyway? First updates to our VW Literature and VW Links pages! Don't Miss The 20th Annual GCVWS Weekend! The premier Volkswagen Show of Western Canada will start with Friday evening Drag Racing at Mission Raceways, continue Saturday with a Pancake Breakfast at CIP1.com, and finish with Sunday's GCVWS main event! Stop by CIP1.com in Langley for a full day of VW action. Enjoy a Show & Shine, Pancake Breakfast (and Hot Dogs later in the day), Shop Tours, Awards from the Friday Drag Night and later a Cruise throughout the local area. The Great Canadian Volkswagen Show will welcome 5000+ car enthusiasts and their families to the Langley Events Centre. Air Cooled and Water Cooled, new and old will be on display. Entry to the show is free for spectators! Bulli Boys VW Transporter Klub � 1991-2011. All Rights reserved.